Massively popular dinosaur survival game is coming to PlayStation 4 computer entertainment system on December 6, 2016. Dubbed the ARK: Survivor’s Pack, this special offering includes both the base game, ARK: Survival Evolved, and the massive desert-themed expansion, ARK: Scorched Earth together for $54.99. The ARK: Survivor’s Pack gives PS4 North American players an up-to-date version of ARK: Survival Evolved that includes the previously released content, plus Scorched Earth - ARK’s first Expansion Pack. The Survivor’s Pack includes exclusive PS4 content including a Bionic Giganotosaurus skin plus an entire Manticore armor set for all male and female characters. PS4 ARK players will also receive a constant stream of major updates packed with new dinosaurs, weapons, armor, mechanics, and lifestyle improvements, until it releases as a final product in Spring 2017. Built on Unreal Engine 4, ARK: Survival Evolved is the first to deliver the popular-on-PC persistent online survival genre to both Xbox One and PlayStation 4, with a unique footprint of adventure, multiplayer online cooperation and competition, focused on the basic survival skills of crafting, harvesting, building, and exploration. In ARK: Survival Evolved, survivors wake up stranded, naked, freezing, and starving on a mysterious island where they must hunt, harvest, craft items, grow crops, and build shelters to survive in every biome. Survivors will tame, train, and ride more than 100 stunning dinosaurs and other prehistoric beasts, including gargantuan creatures on a scale never before seen in video games! In every available biome - Jungle, Snow, Swamp, Redwood, and Desert - you’ll be able to fly an armed Pteranodon squadron over the snow-capped mountains, race through a thick jungle with your pack of trained Raptors, tromp through a fortified enemy base with a convoy of gigantic Brontosaurus, or chase down prey on the back of a raging T-Rex. Meanwhile in the Scorched Earth Expansion Pack, players will wake up in a fiery, drought-ridden desert world, where they must immediately seek water, hunt for food, harvest new flora, craft new items, and build shelter from the extreme heat. 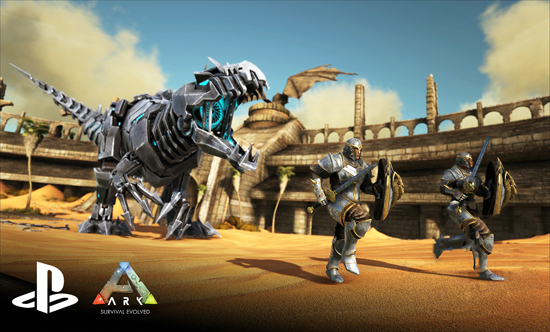 Use skills honed on ARK's faraway Island to kill, tame, breed, and ride the fantastical new creatures that have evolved to survive the Desert's ultra harsh conditions, including... DRAGONS! Where’s the Water? Players must re-learn what it means to survive and thrive in a harsh desert environment depleted of water resources. Explore a New World: Scorched Earth is an entirely new map, composed of seven unique, desert themed biomes – dunes, high desert, mountains, canyons, badlands, oasis and the ever-dangerous dragon trench – each with their own aesthetics, resources & ecosystems, and littered with ruins, geysers, and intricate ancient cave systems. Craft More Than 50 New Items: Discover new outfits and structures to protect from the heat, and new tools to help survive in the harsh environment. Carry temporary shelter with you using tents, employ whips, boomerangs and flamethrowers for ‘defense’, wind turbines to generate clean power, and water wells & oil refineries to harvest scarce resources, among many new mechanics! Tame New Creatures: The desert’s biomes are filled with fantastical new creatures, many of which can be tamed. Lead a caravan of the camel-like Morellatops, or rain fire down on your enemies from the back of a Wyvern. Just mind your step in the vast desert, or you might attract a Death Worm! Conquer New Challenges: Prepare yourself for dangerous electrical storms, blinding sandstorms, befuddling heat stroke, and unleash the power of the Obelisks to come face-to-face with ARK’s deadliest boss creature to date – the ferocious Manticore! Travel Back to the Island: Take characters, favorite creatures and items from Scorched Earth back to the Island, standing out from the crowd and making your Island-dwelling friends jealous with all of the amazing new goodies and secrets you find in the Desert.